With these simple tips, it's a breeze to install a window air conditioner quickly and securely! Whereas putting in a central air conditioning system typically requires a professional crew, installing a window air conditioner is a cinch. Even a self-described hopeless amateur ought to have little trouble here. In fact, you’re likely to become somewhat of an expert on the process, being that most homeowners choose to remove window air conditioners at the end of the summer and reinstall the units the following year. Bear in mind, however, that not all window designs are meant to accommodate such a large, unwieldy box. The following instructions apply only if you wish to install a window air conditioner in a sash or double-hung window. 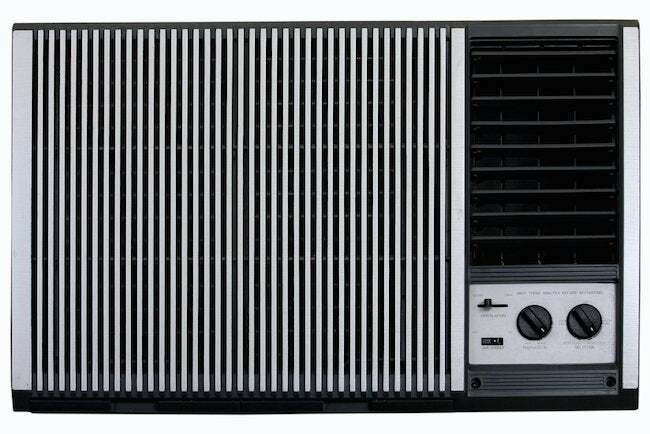 Window air conditioners are sold in a variety of sizes, and each model has a different cooling capacity, rated in BTUs. Many online calculators exist to help you identify the number of BTUs needed to efficiently cool a room of a given size. BTUs aren’t your only concern, however. You also need to be certain that the unit physically fits in your window. Before you shop, measure the width of the window opening and don’t purchase any air conditioner whose housing wouldn’t leave about two inches of wiggle room on either side. Once you’ve purchased and unpacked an appropriately sized air conditioner, you’re ready to install it—but first, grab a friend. Two pairs of hands are best for all but the very smallest air conditioners. Before you move on, attach any provided rails, flanges, or accordion-style panels (or wings) according to the manufacturer’s instructions, using the provided screws. Now your first step is an easy one: Open the window! 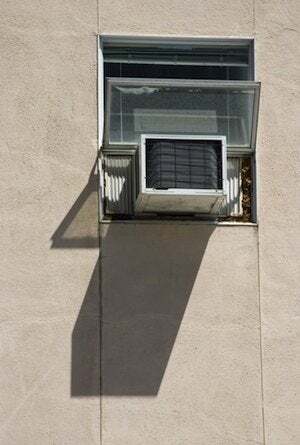 Open it wide enough to accommodate the height of the air conditioner. Next, pick up the unit and rest it on the bottom of the window frame. Have your helper hold the unit in place while you see to the remaining tasks. Most window air conditioners are designed with two flanges—one that runs along the top of the unit, another along the bottom. These flanges facilitate the installation process and improve the air conditioner’s stability. After positioning the bottom flange so that it abuts the windowsill, proceed to lower the window sash (which you had raised in Step 2) until its bottom rail meets the top flange on the unit. The air conditioner should now be held in place by the top sash, but have your helper keep hold of it lightly until you’ve completed the next step. Your air conditioner probably came with one or two small angle brackets that must be used to secure the two sashes together, preventing them from slipping apart or from being accidentally opened, either of which occurrences could cause the air conditioner to fall out of the window. Place the angle bracket against the top sash where it meets the top of the bottom sash. Mark where the screws should go, drill pilot holes, and tighten the screws using a screwdriver. Extend the accordion-style panels (which you attached in Step 2) and secure them to the window using the manufacturer-provided screws. At this point, make sure that all screws that came with the unit have been secured according to the instructions. The last step is to seal the opening between the upper sash and the lower sash, which has been raised to accommodate the unit. Your air conditioner should have come with a foam insulating strip. Cut it to length, then fit it snugly into the gap between the lower sash and the glass panes of the top sash. If your unit didn’t come with an insulating strip, you can—and should—buy one at your local home improvement center and install it. – If you choose to remove the air conditioning unit before the winter, remember to store it upright in a dry location. – If your air conditioner came with L-brackets, be sure to put these in place before lifting the unit into the window.